mom go green: what's in the fridge? I saw an interesting article today on the BBC website. 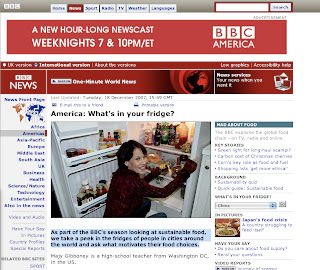 They are running a series on sustainable food, and are taking a peek in the fridges of people in cities around the world and ask what motivates their food choices. The article didn't say anything particularly new, but just appealed to my curiosity about people's shopping habits, etc. Reminds me a little of MTV's Cribs, when the celebrities share the contents of their fridge while giving a tour of their home. I definitely will look at the things in my fridge with some fresh eyes!